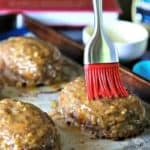 Try this lighter and healthier turkey meatloaf with its sweet and tangy honey Dijon glaze and you may never go back to Grandma’s traditional recipe! Growing up our family had a few standard menus for weeknight dinners and meatloaf with mashed potatoes was one of my family’s favorites. 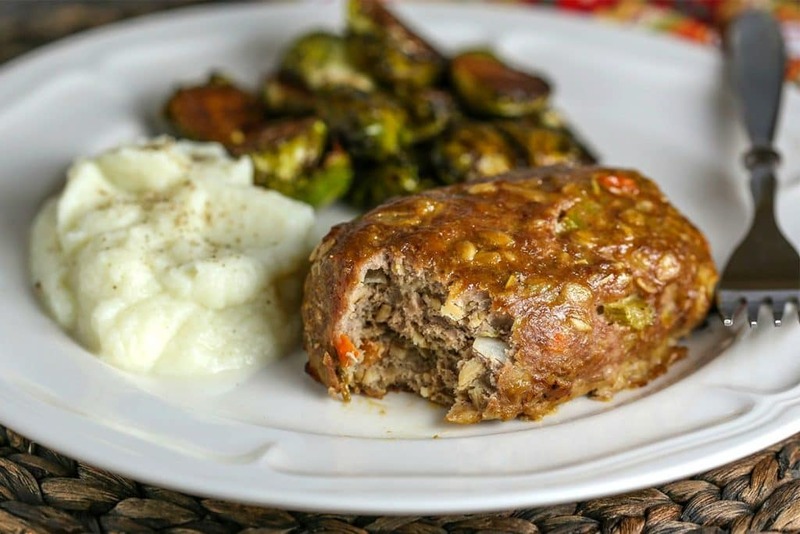 This Turkey Mini Meatloaf with Honey Dijon Glaze reinvents grandma’s recipe by using ground turkey, old fashioned oats, and sautéed vegetables and the result is a moist, delicious, and nutritious weeknight meal. 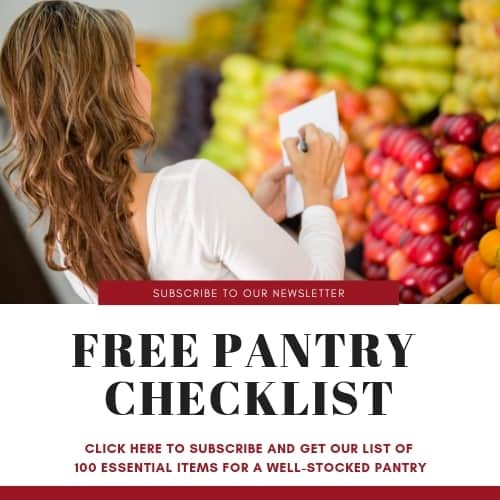 For the past two weeks, I’ve been really focusing on revamping my meal habits and have been taking some clues from the Everyday DASH Diet Cookbook which includes recipes to speed up weight loss, lower blood pressure, and prevent diabetes. Believe it or not, I’ve lost 13 pounds and that has me excited about my new strategy! The key to my weight loss has been making sure to drink plenty of water (at least 8 glasses a day) and to follow a 14-day plan to boost metabolism and jump start my new meal plan. I’ve found that it really works—at least for me—and I’m feeling really good about the changes I’m making! This recipe makes four mini meatloaves which cuts down on the baking time that would normally be required for one large meatloaf. At the end of baking, the loaves are brushed with a simple glaze of honey and Dijon mustard and then returned to the oven for another five minutes. 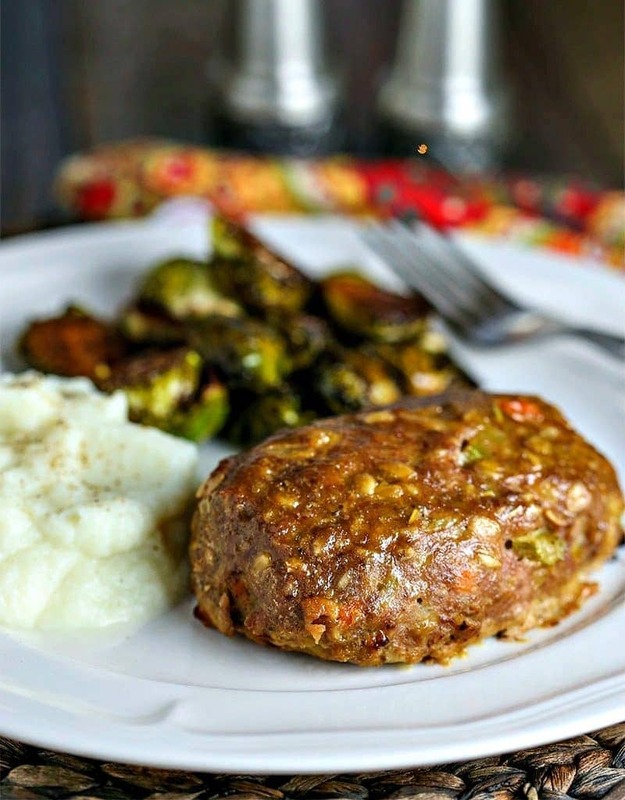 To keep our meal low-carb, I served the meatloaf with a side of mashed cauliflower (instead of starchy potatoes) and broiled Brussel sprouts with a drizzle of balsamic vinegar. 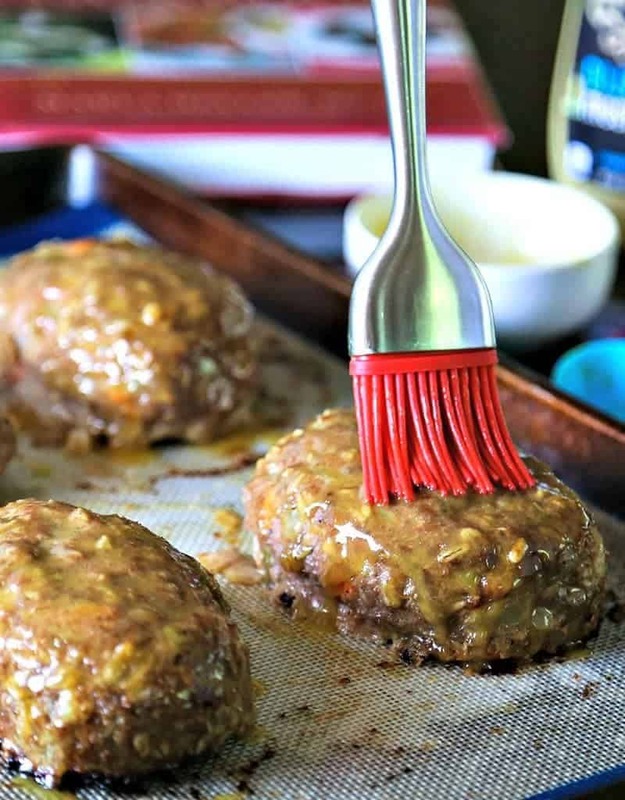 It wasn’t grandma’s meatloaf, but let me just say that it was really delicious—that glaze…yum! My hubby approved and he normally turns his nose up at “diet” food! Be healthy and enjoy, Friends! Try this lighter and healthier turkey meatloaf with its sweet and tangy honey Dijon glaze and you may never go back to Grandma's traditional recipe! Preheat oven to 350 degrees. Line a baking sheet with with a silicone baking mat or aluminum foil lightly coated with cooking spray. Dice vegetables and saute in a nonstick skillet with 2 teaspoons of canola oil for 10 minutes, or until veggies are tender. Remove from heat and cool slightly. In a large bowl, gently mix together the ground turkey, sauted veggies, oats, egg, and spices—this is easiest done with your hands! Divide into four equal portions and make mini loaves. Place 2 inches apart on the baking sheet. Bake until lightly browned, about 35 minutes. Combine the honey and Dijon mustard in a small bowl. Remove the loaves from the oven and baste with the honey-mustard mixture. Return to the oven for another 5 minutes. Let stand at room temperature for 5 minutes before serving. Original recipe by Marla Heller, The Everyday Dash Diet Cookbook. Sounds super delicious, so I definitely want to make this sometime soon. 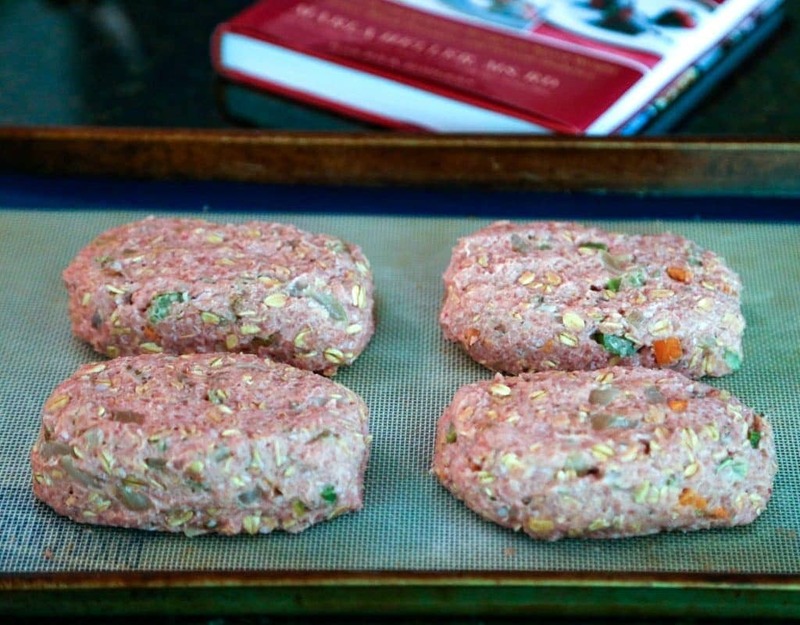 Very often, I substitute ground turkey (or ground chicken) for ground beef. I always have ‘quick cooking oats’ on hand, so can I use them in this recipe, instead of ‘old fashioned oats’? Please advise. Hi, Angelina. I think you could certainly substitute the oats, but you may want to add a couple extra tablespoons to the recipe. Please let me know how it turns out! I’m so happy you stopped by! 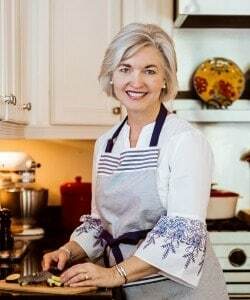 I’m a Southern girl who enjoys cooking, photography, music, and sharing good food with family and friends. Please stick around a while and see what’s cooking in my kitchen.